But I can’t stop. I find myself looking around the garden and wondering which of my plants will still be alive come spring. What about you Mr. Hardy Dyckia? Are you really? Or are you just another spiky poser intent on breaking my heart? And you Ms. Grevillea? You’ve claimed this area as yours, will you make good on that claim, or turn brown and retreat? What will the coming winter bring? Experiencing back to back horrid winters I’m a little gun shy heading into this one. This spring I started off buying and planting being very careful to stay on the low side of the zone scale. While we are thought to be a solid zone 8 I vowed to stay with the 7’s and lower. 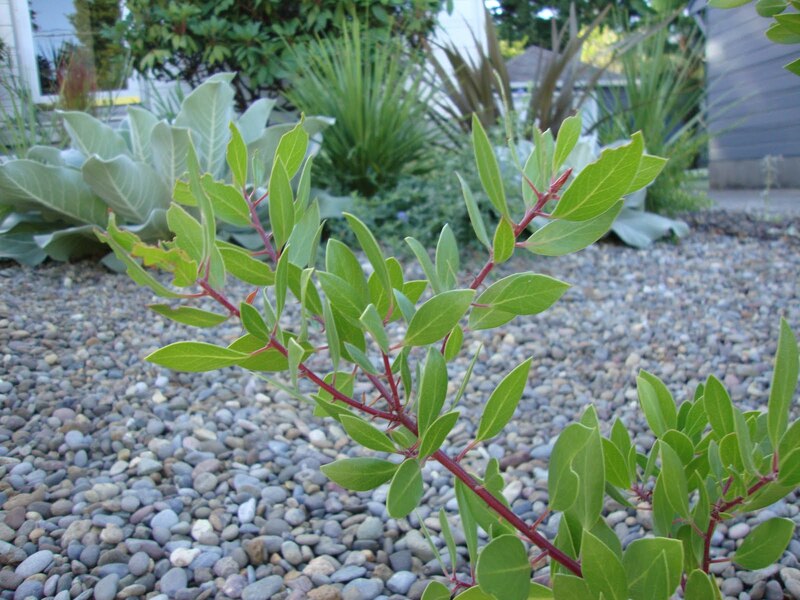 Like my Manzanita (Arctostaphylos densiflora 'Harmony'), it should be hardy to a low zone 7. But naturally as the horror of last winter started to fade I started to lean back towards my usual zonal denial. 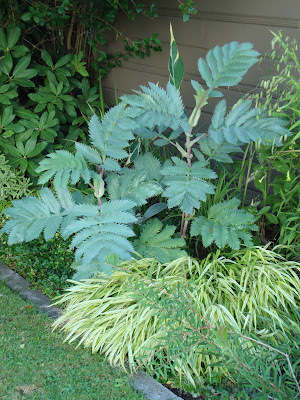 For example I planted a Melianthus major knowing full well that it is only marginally hardy here. Will it make it through the winter? As you enter the back garden your eye is drawn to its sharply toothed large blue leaves, it will be missed should it go away. 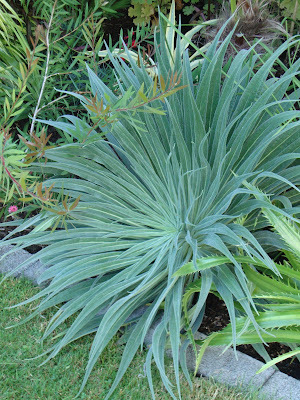 The same for this Echium…. 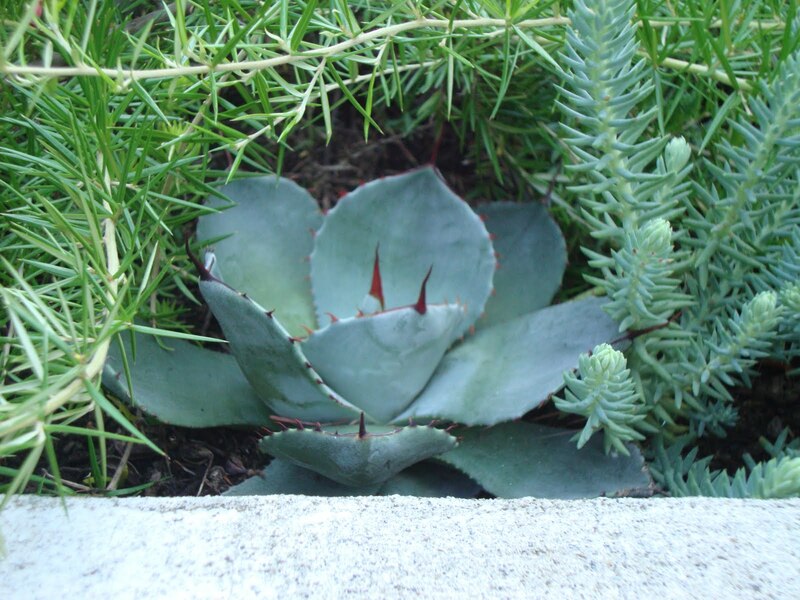 Naturally there are a couple Agaves that snuck into the ground, against my better judgement. Like this Agave parryi truncata…. 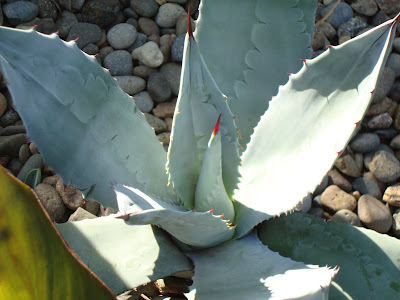 And these Agave americana (from the in-laws in New Mexico). They were outgrowing their containers and I decided to free them. Have I also sentenced them to death? 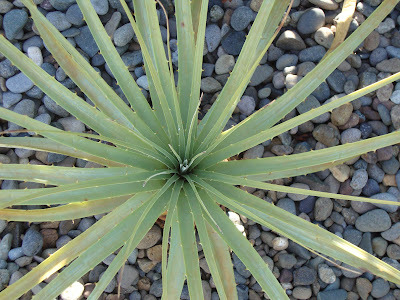 These Puya were a bargain (cheaper than most annuals). I planted them knowing it wasn’t likely they wouldn’t live through the winter. But still a girl can hope. I hope. Remember the Opunita that I got from a generous neighbor? They’ve grown! Several new paddles and a couple of blooms too! Will they live? I’m not just going through this mental exercise in my own garden. 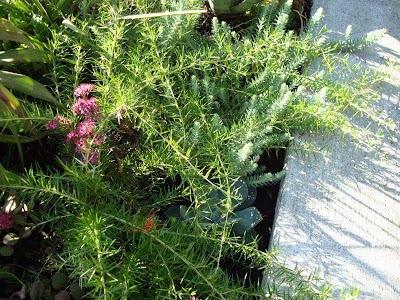 I’ve also been watching things in new gardens being planted around town this fall. I see things going in that I know won’t make it through even the best of our winters, let alone ones like the last couple. At first I wondered “what are they thinking!” And then I began to question how many new gardeners understand how to sift through the plants available at the local nursery and determine what’s hardy and what’s not? Do nurseries do an adequate job of educating people on what should be hardy in their climate vs. what "might be", and what doesn’t stand a chance? Is that even their responsibility? A few days ago I was carrying on (the things my husband has to put up with! 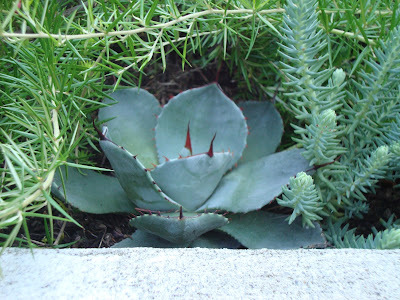 ), wondering why someone would plant a certain Echeveria in the ground in Portland in September; after all it’s just going to die! My husband pointed out that he would. If he walked into the nursery and saw that plant for sale he would assume he could put it in the ground here, not knowing that it may not be hardy. Maybe he’s right, and it’s an unfortunate learning curve for new gardeners. But I should know better. I should be aware of the clues on the plant tag that tell me this could be another heartbreak. What’s my excuse? Why do I keep flirting with disaster? I don't think its nurseries responsibility to educate on hardiness, but I sure wish there were more nurserymen who had a clue. 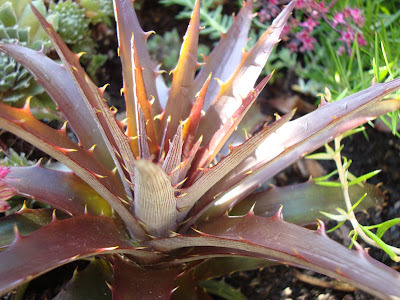 I will say that the "poser" dyckia is probably best protected, at least to start out with so you can see what it handles. A cold winter there is very different than one in say, Florida. I for one am grateful that nurseries have tender plants, since that is after all what I'm all about! Oh gosh RFG...don't get me wrong I am TOTALLY with you on being glad that I have such great access to plants that aren't hardy here. I wouldn't want them to only sell things that are. That would be horrible. I was only trying to re-frame my thinking that the gardeners that were planting tender things in September were crazy and wondering if they were perhaps not entirely to blame. It would be nice if garden centers included a designation on plants such as "hardy and easy" or "hardy and difficult" or "borderline and risky." 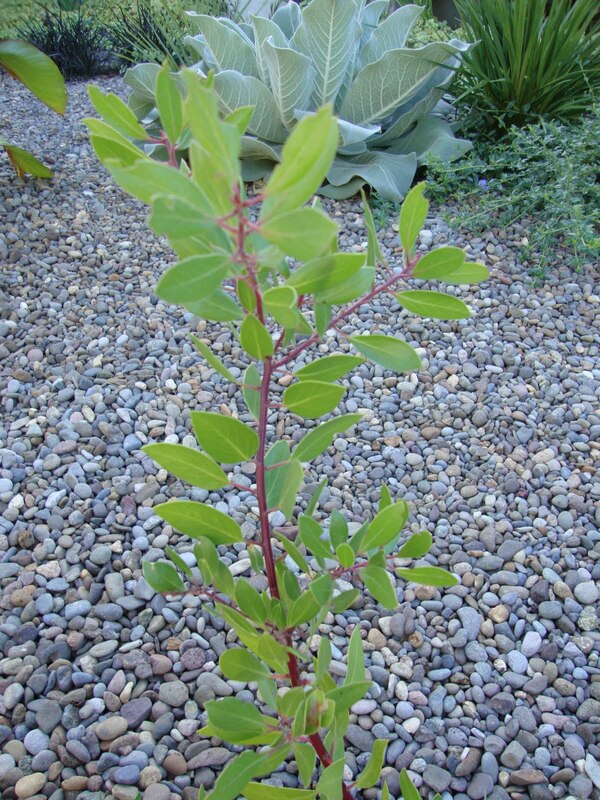 I often find plants at local garden centers that are poorly labeled or mislabeled (should I have to ask how large that grows, what kind of lighting it needs and how wet it likes the soil? I wish I could afford a smart phone so I could look them all up on the internet! and worst of all is when the garden center staff doesn't know the answers to my questions about cultivation!). Oops. Got a mini-rant going there. I like to push the zones in my garden. I consider it a sign of hope that the winter will be mild or the plant will be just a touch hardier. Unlike Rainforest Gardener, I DO believe that nurseries have a responsibility to inform customers which of the plants they're selling will need winter protection. Informative signs can accomplish this. Barton Springs Nursery in Austin, for example, has perfected the informational sign about growing conditions for each plant, and I've learned a lot from them. By all means, nurseries should offer tender and exotic plants for sale too. But just label them as such so that newbies can make an informed decision about buying. There's nothing surer to turn people off gardening than believing that everything they plant will die. And why not, when that's been their prior experience? I am going to put my money on the Opuntia. It says Melanie(my wife) but it's David. Your garden is beautiful and I can tell those plants are happy! I broke down last year and built a temporary greenhouse because I was so tired of losing plants that were borderline in hardiness. Otherwise, I'd have to tote them inside the house during each freeze warning. I don't keep a warm greenhouse...it goes up and down with the daily temps and then I turn on heat lamps to keep it above 35. Still, I have plants each year that outgrow my strength to carry them and so they are left to the elements. I bat about 90% survival since most are root hardy. My adage...Nothing ventured,nothing gained. Some of these plants might be tougher than the labels. Others always turn to mush no matter what. You could build many greenhouses with pvc pipe and plastice sheeting around those you most cherish...that blue-green Echium is to die for. Like Scott says, the small, owner-operated nurseries are much more knowledgeable about their plants than, say, a Means, where prices are lower, stock is more ordinary and the hired help know next to nothing. But "Why" you ask? Loree...you know it is because you love to live dangerously. Apparently it is a common trait. I saw Leonitus flying out the doors at HPSO, and it will take some special pampering to see those through any winter. I live in zone 14 but a 15 minute drive puts me in a zone that is basically frost free -zone 17 (talkin' Sunset zones here)-lots of micro climates squished into a relatively small geographic area.A unique challenge for nursery folk, requiring them to 'qualify' the customer somewhat. How cool though to be able to schlep down to a garden center in zone 17 and bring home stuff that is marginal here in 14. Hi Loree~~ You've really touched on an important subject here. I think it's the responsibility of the nursery to state what's hardy and what's not. Having good plant tags is a must but how easy is it for plant purveyors to make it easy by putting non-hardys in one place, hardys in another? 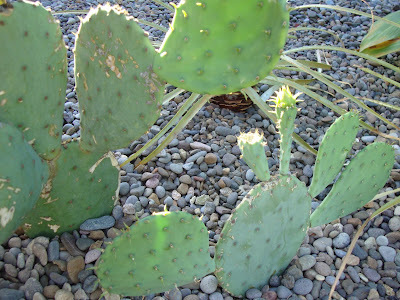 Still a gardener should do the appropriate homework and ultimately take responsibility for their own garden's inhabitants. Your Melianthus looks to be planted in a really protected area. Lots of leaves and even a bucket if it gets really cold and I bet your specimen will sail through. Last year I left mine unprotected and suffered the typical result. This year it's in a container and going inside when/if the thermometer does a tumble. Ditto for the 'Maurellii' you mentioned on my blog. 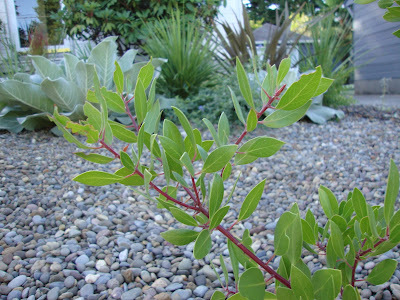 If a gardener in Spokane can do it, who are we to be whimpering? :) But for those lovely in-ground members, I'm praying for a mild winter. Diana, I appreciate your mini-rant! Just the other day I bought a sedum that had two labels in the 4" pot. One from the company that developed it (copyright? patent? I forget the correct name) and one from the grower. Neither tag told me the hardiness of this sedum. NOT helpful. Yet I bought it anyway because I loved it. Pam, great point! If they don't realize that the plants they are buying are naturally going to die in the winter then they might think they are hopeless themselves and stop gardening! Matti, I'll let you know come next summer. 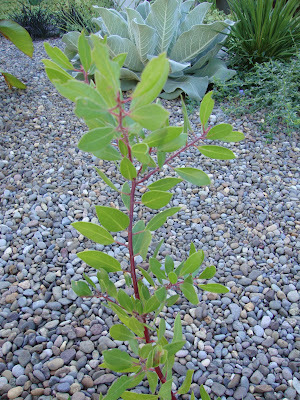 scott, I came SO CLOSE to buying that Salvia discolor at Joy Creek a few weeks back. I don't know how logic won out, that's not like me. If the Melianthus dies I'll probably have to buy a replacement next year. It's grown so fast and I just love it. I'm glad to hear that the local nurseries are talking sense, it gives me hope! ks, very interesting, I need reminding of these issues as they definitely would make it difficult for the nurseries to sell plants appropriate for everyone. Grace, I tried to be really aware of the placement of the Melianthus and give it a fighting chance. A mild winter? God that would be wonderful!